In an article by SFM (full article), the New England Healthcare Institute reports the national overuse of hospital emergency rooms results in $38 billion in annual wasteful spending. And that an estimated 56% of ER visits could be avoided! Not only is it costing the individual more money, but it is also costing the employer more money in terms of their health benefits and/or work comp costs. Aside from the dollar figures associated with visiting an ER instead of primary care provider, the quality of care varies as well. 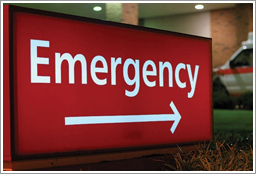 An ER is equipped for the doctor to do the initial triage treatment and delegate any follow-up care. There tends to be lack of long-term treatment for the patient. Which could ultimately cost more money for additional treatments if a long-term treatment plan is not discussed at time of injury. However if a patient is able to visit their primary care provider, an urgent care facility, or a specialty clinic, it typically has a more ideal outcome as the individual is treated by a specialist who is able to guide the treatment. Ultimately, staying out of the ER when possible will lead to better medical outcomes, less frustration, and reduced costs. WellCompForLife can reduce costs for your health benefits AND work comp to positively impact your bottom line.